Serial sexual abuser Larry Nasser was attacked and injured in prison, according to court documents filed by his public defender. 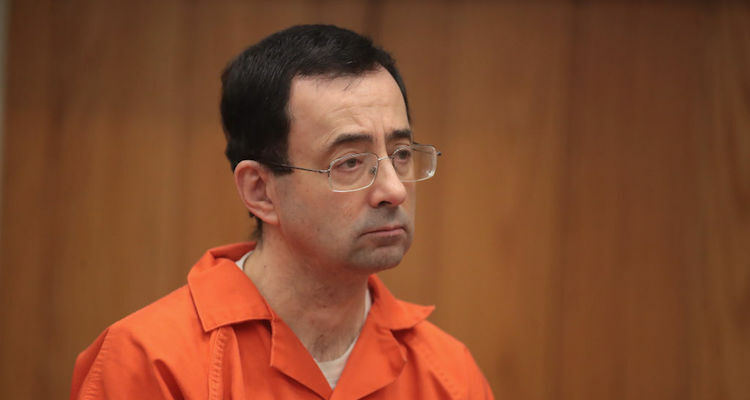 Nasser is currently serving a prison sentence of 40 to 175 years after being convicted of sexually molesting more than 150 girls and women over a 20-year period while serving as a physician for Michigan State University and USA Gymnastics. Over 200 women read victim impact statements at Nassar’s sentencing hearing in January, including USA gymnastics stars Aly Raisman and McKayla Maroney. According to his court-appointed attorney, Jacqueline McCann, back in May Nassar was assaulted within hours of being released into the general population at the federal penitentiary in Tucson, Arizona. Nassar is said to have suffered injuries in the attack. However, the extent of those injuries is unclear, as are other details of the attack. What we do know is that Nassar’s attorney has accused the judge in his criminal case of inciting the violence. Though nothing is going to get Nassar out of prison, it seems his attorney is trying to link the attack to the judge’s actions in an effort to get him relocated.